How do you establish a loving relationship to a woman if you are a male to female crossdreamer dreaming of being a woman? There has been a lot of politics on this blog lately. That is necessary, I am afraid, given what people say and think about crossdreamers. But today we are going back to the basics: to the lived lives of crossdreamers. I will share an email I got from a reader with you and add my response. 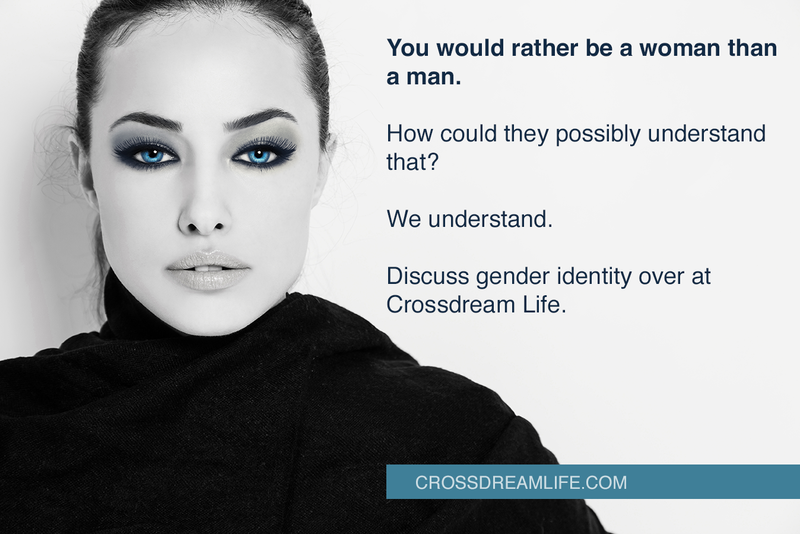 I think this is an exchange many male to female crossdreamers will find familiar as well as interesting. Do add your own comments! "I'm thankful to finally have a name attached to this conditon and know that there are others, but I still feel sometimes so confused and conflicted. I'm sure that in this community my story and my questions are common. When I was a little kid I don't remember being one of those that insisted that I was a girl. To my recollection I was fine being a boy, but I was always 'soft'. I've always been passive and introverted. Iused to play with my sister and her dolls and saw nothing wrong with it but I did boys stuff too. I always liked to play sports but never excelled at it. I was always picked on by the alpha males in my school, especially in junior high, and I was never successful being a romantic interest for the girls. I was just too shy. When I remember my AGP feelings starting to make themselves known was around puberty. The girls in my class started developing hips and breasts and I was thinking "That's pretty cool, I wish I had that too." By the time I was in high school I secretly wanted to be one of the girls.